For the first time, an insightful and entertaining book of quotations from some of our finest actors, directors, writers, producers, casting directors and coaches exclusively on acting: the art, the craft, the nerve, and the thrill of acting, what it takes to “make it,“ and the joy of what it means to be an actor when you are doing it right! With quotes from Ford, Roberts, Spielberg, Brando, Stone, Scorsese, Hanks and many others, this is “acting in a nutshell” from those who really know. 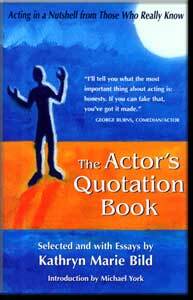 From the author of Acting from a Spiritual Perspective.